Enterprise and Large Enterprise Sales Executives within an eight week period. This would enable their attendance at the annual sales kick off and result in having a full team in place, for the beginning of the financial year. 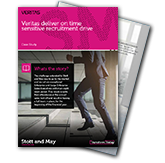 After delivering on our promises Stott and May have gone on to place 45 candidates with Veritas over an 18-month period - including 21 territory account managers across 15 countries. Find out how by reading the case study.